Problems seemed to be the order of the day for all the Toyota teams. Camry driver Ryan Truex (10th) was the highest-finishing Toyota driver in Saturday afternoon's NASCAR Nationwide Series (NNS) race at New Hampshire Motor Speedway one-mile oval. Other Toyota drivers in the field at Daytona included Brian Scott (12th), Mike Bliss (13th), Jason Bowles (16th), Joe Nemechek (19th), Tayler Malsam (20th), Eric McClure (22nd), Kyle Busch (28th), Travis Pastrana (31st), TJ Bell (35th) and Jeff Green (43rd). RYAN TRUEX, No. 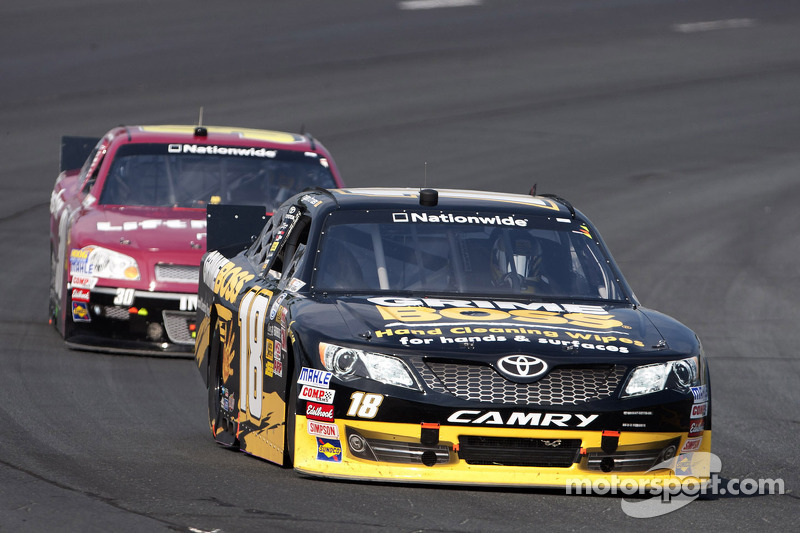 18 Grime Boss Toyota Camry, Joe Gibbs Racing Finishing Position: 10th How was your race today? "Our car was a handful the entire race. We just couldn't get it figured out. It's so hard to pass. Once the restarts were over we were just stuck where we were. We were just too free on restarts to make any ground. A top-10 is good, but it should have been better." BRIAN SCOTT, No. 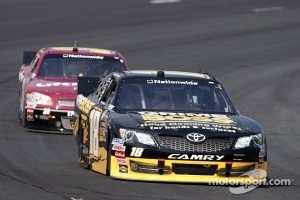 11 Dollar General Toyota Camry, Joe Gibbs Racing Finishing Position: 12th How did your car handle in the race? "We just missed the setup on the No. 11 Dollar General Camry. We couldn't get both ends of the corner balanced out. We would be loose in and tight off or we could be okay in and loose off. We just fought it -- we went the wrong way and what really killed us is that we could not get going on restarts. That hurts here when you lose three or four positions every restart -- it's almost impossible to make them back up. We'll just go on to Chicago -- Chicago is going to be our best race track. We've been looking forward to it. Excited about our opportunity to win a race and looking forward to getting Dollar General in victory lane." How difficult was it to pass? "It's tough. When you're not handling like we weren't today, it makes everything tougher too. Even with the perfect car, lapped traffic and even a car that's three-tenths slower than your lap is really difficult to pass. We just had our hands full too much and couldn't capitalize on any opportunities that were presented to us throughout the course of the race. Just not a very good Loudon (N.H.). We'll go onto Chicago." TRAVIS PASTRANA, No. 99 Boost Mobile Toyota Camry, RAB Racing w/Brack Maggard Finishing Position: 31st What happened that took you out of the race? "Just the tire went flat coming into the corner. It bogged up real bad on that first restart -- I guess it wasn't green yet, but everyone took off like it was green so I started shifting through the gears and it just stacked up. We knocked the car out of alignment and it got really tight in the front. I couldn't turn the car at all. They gave me such a great car to start out there. I hate that I just went too soon on that first green when everyone started going. With it tight all day, that's what we had the first time and it just wouldn't turn so I was locking up the brakes a lot trying to get the car in and eventually just wore out that right-front tire." Do you have to view these experiences as part of the learning curve to NASCAR? 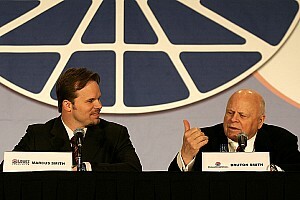 "My spotter just never said, 'Green.' Everybody took off so I was like, 'Here we go.' I guess you could say, 'It is what it is.' It's a learning experience and I'll make sure that never happens again. I know we keep saying this race after race, but every race we're learning something. After that, we just didn't have a car that would turn. That right-front (tire) was just absolutely shot so eventually it was going to give." Are other drivers helping with your learning curve? "Everyone has been great to me, even with (Joey) Logano jumping in the car for me and Jimmie Johnson coming over yesterday to scribble with a Sharpie on the ground really to kind of show me some lines. I've never had such a great support from everybody. I have to thank everybody. It's just frustrating when we ball it up before we even get to go. Then after I'm already driving, the right-front (tire) goes down."